Dmitry Andreikin defeated Sergey Karjakin, who got in huge time trouble, and shares the lead with Hikaru Nakamura, who drew with Fabiano Caruana. In yet another decisive game Rustam Kasimdzhanov got a winning position against Shakhriyar Mamedyarov but after wild complications the game ended in favor of Azeri player. Boris Gelfand luckily escaped in the endgame against Maxime Vachier-Lagrave. Teimour Radjabov chose to play Berlin Defence with Black pieces this time and hold a draw against Anish Giri after 52 moves. Jobava and Jakovenko drew a very complicated game. Shakhriyar Mamedyarov, Maxime Vachier-Lagrave and Baadur Jobava share the second place half a point behind the leaders. As the weather in Tashkent was changing from summer to winter, the tournament situation had also significant changes. After 7 hours of play Hikaru Nakamura defeated Boris Gelfand to replace Maxime Vachier-Lagrave on the top of the table. The leader of the first part of the tournament lost against Dmitry Yakovenko, who scored his first victory in the tournament. Baadur Jobava sacrificed a piece and won an exciting game against Sergey Karjakin. 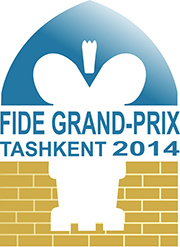 Other games Radjabov-Andreikin, Kasimdzhanov-Giri and Caruana-Mamedyarov finished in a draw. Baadur Jobava, Dmitry Andreikin and Maxime Vachier-Lagrave share the second place half a point behind of Hikaru Nakamura. In the longest game of the day Maxime Vachier-Lagrave tried to convert an extra pawn against Sergey Karjakin, but there was no way through and the players settled for a tie. With all games drawn, Vachier-Lagrave continues to lead the standings with 3 points. Saturday 25th October is the first rest day. 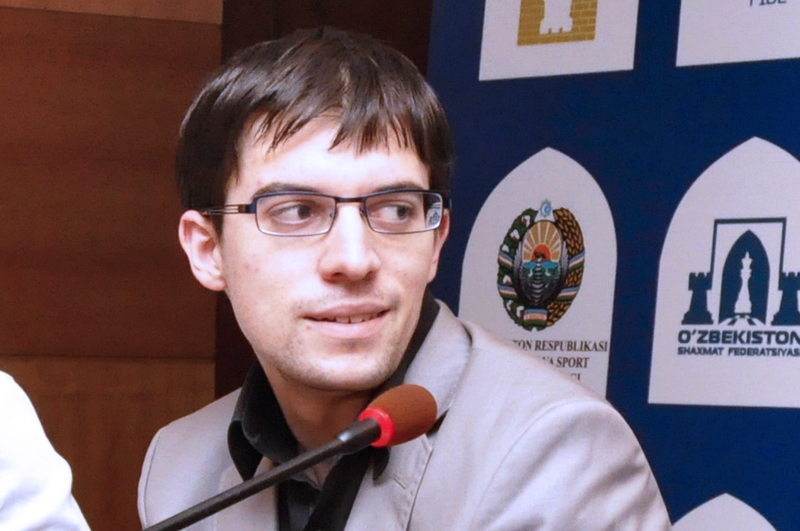 Maxime Vachier-Lagrave kept his half point lead in round 3 of the FIDE Grand Prix in Tashkent. He managed to hold a draw with Black against Teimour Radjabov after long defence. Sergey Karjakin outplayed his compatriot Dmitry Jakovenko and shares the second place with Hikaru Nakamura and Dmitry Andreikin, who drew with Anish Giri and Fabiano Caruana respectively. Rustam Kasimdzhanov sacrificed a pawn in the opening but lost the thread of the game in a complicated position against Baadur Jobava. Shakhriyar Mamedyarov profited from a mistake in the endgame by Boris Gelfand after 6 hours of play. Maxime Vachier-Lagrave became the sole leader in the tournament after defeating Rustam Kasimdzhanov. It turned out to be the only decisive game in the second round as all other five encounters finished in a draw. Fabiano Caruana was very close to strike back after his unfortunate start but was held to a draw by Baadur Jobava. Dmitry Andreikin and Hikaru Nakamura were first to finish their game after repeating known line from Anand-Shirov. Anish Giri introduced an interesting novelty in the opening but didn't manage to convert his advantage against Shakhriyar Mamedyarov. Boris Gelfand and Dmitry Jakovenko could not break through stubborn defenses of their opponents Sergey Karjakin and Teimour Radjabov.